Having a baby is finding someone you love more than yourself. Often times they call this the most rewarding experience a human can have. And then the daily grind hits you. Mentally and physically, rearing a baby is taxing work… no matter how rewarding or holy and experience it is. As a simple instance, carrying your baby, picking him or her up again and again is strenuous work. A baby carrier is a necessity. A necessity yes, but not without it’s faults. For one, the shoulder straps and waist belt put needless pressure on your body. And second, just looks bad when you have to wear it outside. Samsung’s C-Lab, an internal program that aims to foster innovation at the company have set their eyes on solving these two issues of early parenthood. 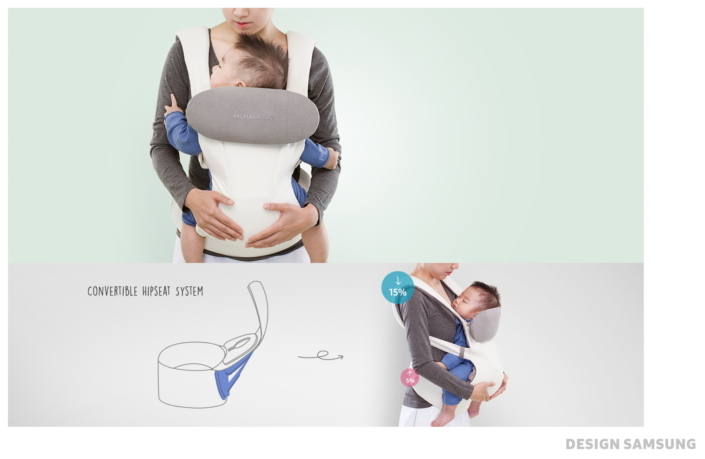 The result is an infant support carrier that monitors baby’s health and is comfy for both parent and baby. Ladies and gentlemen and babies… meet Dr. Macaron. While we can’t reduce the baby’s weight we can distribute the load away from just the certain part of your body. 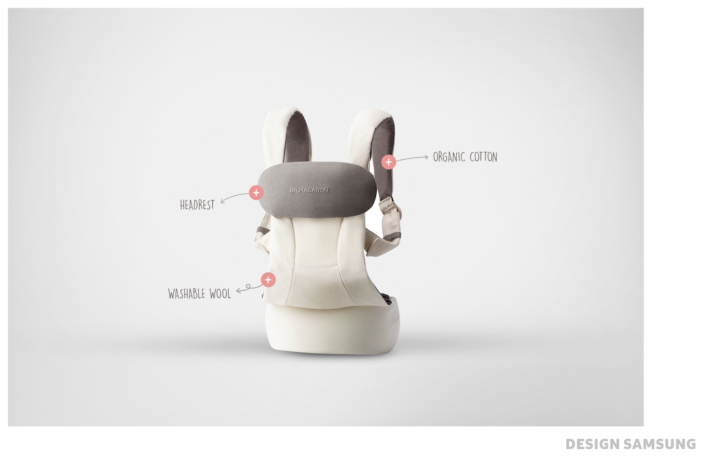 Dr. Macaron has a Convertible Hipseat System that can be adjusted with one hand. Raising the seat of the carrier divides the weight away from the shoulders to be shared with the waist so that mommy can concentrate on the precious cargo inside. Dr. Macaron is a minimal no-nonsense design baby support system. We discarded anything that stuck out or didn’t feel in place and hid buckles and other contraptions away from view. Unlike most baby carriers, we chose a light ivory color instead of the often seen usual dark drab for a clean pure feel that will go well with any outfit. Dr. Macaron isn’t only a baby carrier. In fact, it is a smart care service for your baby with a very well designed carry support. 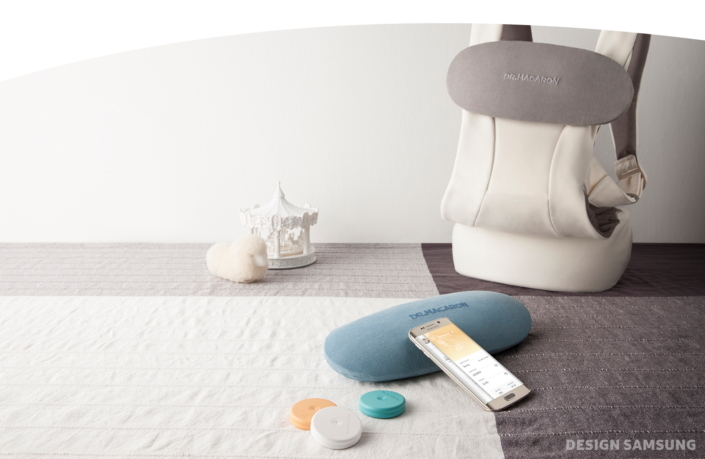 Simply by putting the small macaron shaped sensor into the seat of the carrier Dr. Macaron monitors if the baby needs a diaper change. Also, the sensor will check your activities and let you know how long you’ve been on your feet and need a breather. With the app it’s easy to keep a day to day record of your cute lil button growing up without having to keep a pencil and notebook handy at all times, keep it all on your smart device! 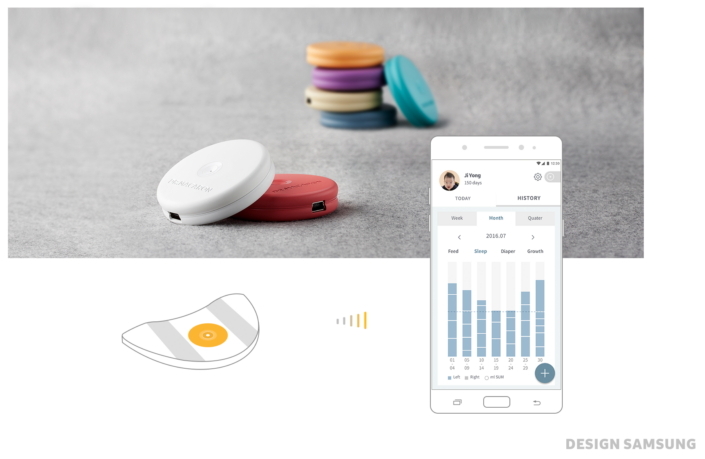 The small macaron shaped sensor in the seat of the carrier sends data to the pre-installed app in realtime. This data is processed and presented to you so that you can keep track of the leaps and bounds your baby is making day to day. Dr. Macaron tackles a major problem shared by many in carrying their babies without wearing themselves out. Like a real macaron, a sweet outer shell with an even sweeter filling inside. A delicacy to sweeten your time with your baby. Questioning things we took for granted and trying to improve upon them. That is the underlying approach for Dr. Macaron. It ends with a warm hug utilizing design and technology. Here at the C-Lab in Samsung Electronics we’re looking for unique and different solutions to life’s many questions with the answer of making it better. *This product is under development and not yet available for sale.